On a purely technical level, William Friedkin’s “Bug” is one of the simplest films you will see this year, if you see it at all. It has only seven speaking roles and takes place almost entirely on one fairly ordinary set. It is being released in the middle of a summer movie season full of action-packed blockbusters, and has no special effects or star power to its advantage (unless you count Ashley Judd as star power). It is being billed as a terrifying horror film, and promises the sort of torturous jolts provided to audiences by the “Saw” films, but there is really very little of that, either. “Bug” is merely an incredibly effective observation of sad, lonely people taking a desperate journey into madness. Judd plays Agnes, a divorced Oklahoma woman living in a run-down apartment. Her life is quiet, lonely, and stagnant. Every once in a while, she will go out for a night out the town with her lesbian friend R.C. (Lynn Collins) to do some drinking… but mostly, she just sits at home, with a few lines of cocaine to keep her company. To make matters worse, her aggressive and violent ex-husband (Harry Connick Jr.) has just gotten out of jail, and he seems determined to restore his relationship with Agnes whether she likes it or not. Agnes is indeed very lonely, but doesn’t seem eager to change her situation… her cynicism and lack of trust towards people in general outweighs her desperation for companionship. Still, she’s pleased to meet Peter (Michael Shannon), a quiet man R.C. introduces her to. Peter seems strange and perhaps just a little bit too quiet, but he slowly forms a friendship with Agnes, and is soon sharing a bed with her. Friedkin’s direction is steady and simple, slowly but firmly heading towards a nightmare of a conclusion. Some will question the choices he has made in the way he tells this story, but I think he made the right decision. Though Friedkin allows us to see inside the tormented souls of these two characters, he never allows us to share their fear and paranoia. Not once are we convinced that there might actually be real bugs, or that Peter’s conspiracy theories about the government might have something to them. We observe with a detached sadness, and by allowing us to do that, Friedkin allows us to direct our emotions towards these two people, and away from our own fears. Music is provided by Brian Tyler… well, what music there is. I don’t know how on earth Tyler managed to fit an hour of score material onto his (available for download only) score album, because it sure doesn’t seem like there’s very much there. Most of the scenes in the film are either underscored by quiet tunes piping out of the radio or nothing at all. The few score pieces here are quiet and subtle, containing barely audible fragments of musical sounds, instruments plucked and played with suspenseful caution. There’s certainly a lot more to talk about when it comes to the music on the album, but I’m quite positive that a lot of it is missing from the film, for one reason or another. As for the score’s effectiveness, well, I suppose it certainly helps set a mood, but there’s really very little of it… and what is there does not do anything to make itself heard. Do not consider my two-star rating a reflection of negative feelings towards the music; it’s simply that there just isn’t much to say about the score as heard in the film. To be honest, I’m quite surprised that “Bug” received a wide release. Though trailers for the movie might be able to convince a few people otherwise, this is certainly not your typical horror film. It is also an incredibly difficult film to watch, despite superb dialogue and top-notch production values. Still, give it a chance… it holds you in it’s grip, and the raw, sometimes stunning performances of Shannon and Judd prevent you from being able to look away, even when you want to. Despite moments of terror and nerve-jangling intensity, the film is an essay in depression and loneliness… as such things go, they don’t get much better than “Bug”. Highly recommended. Music composed and conducted by Brian Tyler. Edited by Joe Lisanti. 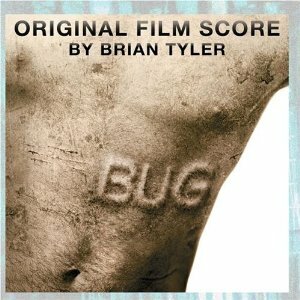 Score produced by Brian Tyler.